The sign outside the Lane Motor Museum states "Unique Cars from A to Z". The car collection within proves the proclamation. The Museum at 702 Murfreesboro Pike is just a few miles outside downtown Nashville, Tennessee and they have plenty of free parking. 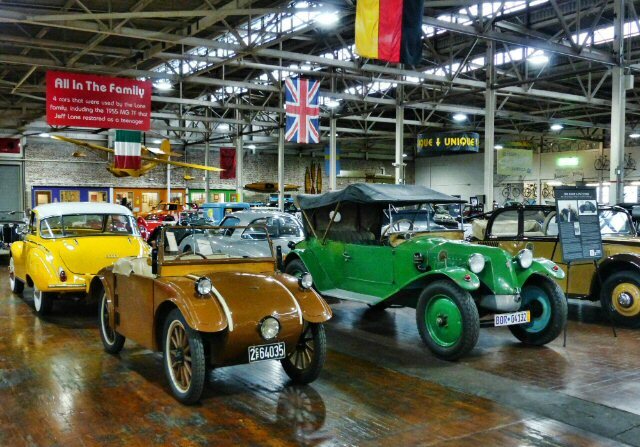 The Lane Motor Museum is one of the few in America that specializes in European vehicles. It is a working museum that maintains all forms of transportation in running order. In addition to cars the Lane has airplanes, bikes, motorcycles and military equipment including the very large LARC LX located outside in the back of this expansive exhibit. Some of their cars are in showroom condition, while others represent typical aging. Efforts are made to restore each vehicle to near-original specifications. The Lane's welcome film explains how Jeff Lane founded the museum. Jeff's family was involved in the auto industry so he already had an interest before restoring his first car (a 1955 MG TF) which led to more and a lifelong passion. Lane's personal collection was the donation that began the foundation with the Museum opening its doors to the public in October of 2003. 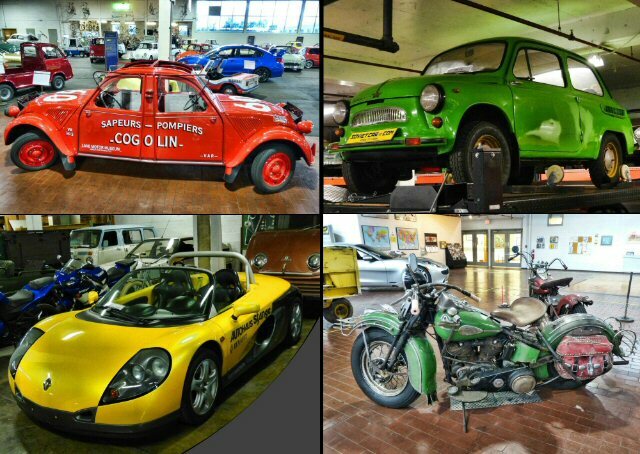 The ongoing mission of the Lane Motor Museum is to "collect, preserve, document, and interpret an eclectic and technically interesting collection of cars and other transportation-related objects for the purposes of educating the public about the history of transportation". The film also advises visitors that the vehicles tell stories of economics, geo-politics, history and innovations. We read about Tatra (a Czech company) that was known for the best horse drawn carriages and how they transitioned into a successful car maker. Most of the displays had placards with information about the auto. 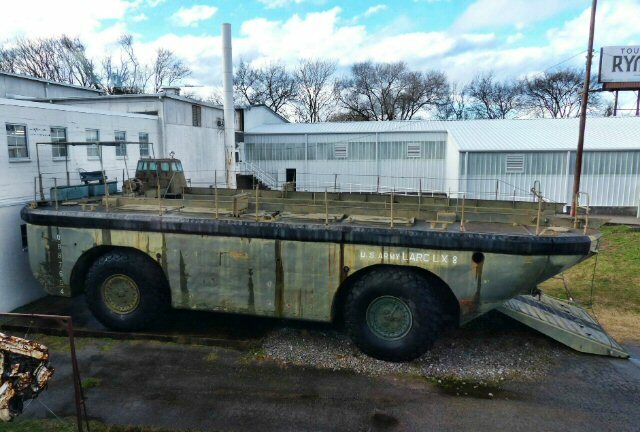 In many cases materials or lack of materials determined the size and style of the vehicles. Oil shortages also dictated the decades when micro cars were popular. 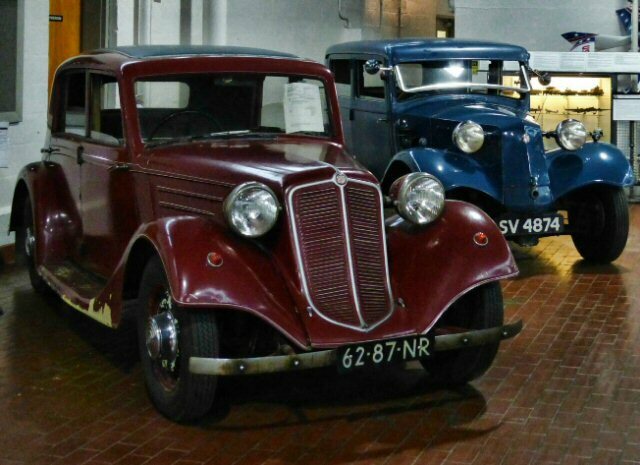 At a quick glance folks will observe that most of the European brands were smaller especially in comparison to collections of American cars from post WWII. The museum is well organized with country flags above to indicate where autos from Germany, Italy, the UK and more can be found on the floor. 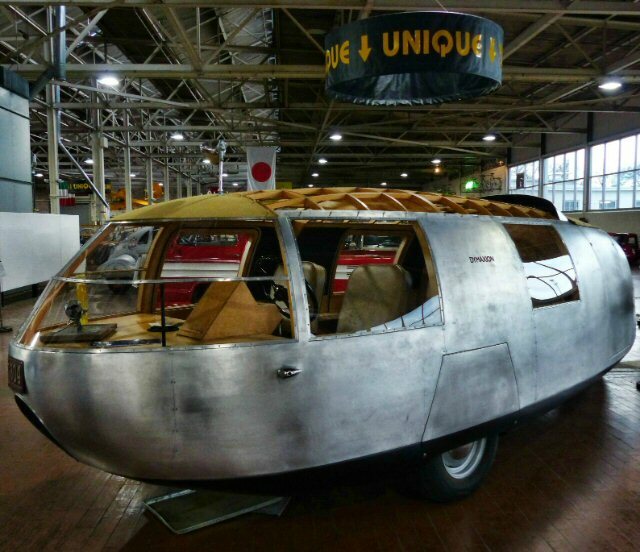 Besides European models the Lane has a number of build your own cars, rare prototype vehicles and replicas which includes a 1933 Dymaxion. Inventor Buckminster Fuller designed only 3 of these autos. It took the Lane 8 years to construct their representation of Bucky's car that had a number of distinctive features such as a full streamlined body, rear wheel steering and a mid-engine front wheel drive. In addition to the expansive exhibit area the Lane also has an art gallery along with a play area for future drivers. On most weekends for an additional fee, folks (30 max per group) can sign up for a guided Vault Tour. Well over 100 cars are found on the main level but there are even more downstairs. Below our host Aaron asked us if we noticed that their cars had license plates. Sure enough they did. He explained that since most of the Lane collection is in running order many of the autos go out for rides or attend events. As Aaron shared information about certain cars he was also able to tell us of his experiences in driving some of these gems. We also learned that much of the maintenance and restoration takes place on site. Since the top floor can only house so many items at one time the vehicles are routinely rotated so for locals it means you can visit the Lane more than once as the cars and their stories are changing. Also, some of the items are on loan such as The Dan Auerbach Collection of Vintage Harley Davidson Motorcycles 1937-1950 that will be at the Lane until May 6, 2019. "Unique Cars from A to Z" aptly describes this assortment of automobiles and more. Although the focus is European there are American models mixed into this diverse collection. Director Jeff Lane continues to search out cars that are technically significant or uniquely different supporting the goal of Lane Motor Museum to collect, present, preserve and share automotive history for present and future generations.